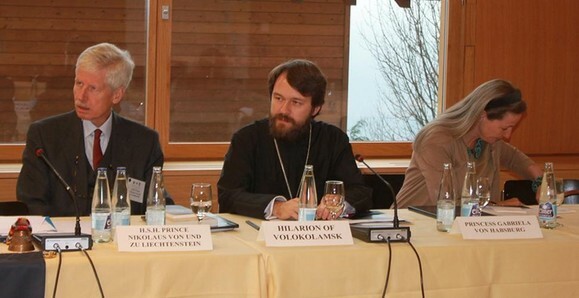 We are publishing the remarks by Metropolitan Hilarion at the Colloquium on Serious Crisis in Syria, Vaduz, Lichtenstein, November 17, 2013. “We have gathered together today to discuss the most terrible humanitarian disaster of the last decades – the tragedy of the Syrian people. What is happening there today is a real, I will dare say, genocide unleashed against Christians and other religious minorities. It is none other than a purposeful policy pursued by extremist and terrorist forces. We are aware that the Syrian conflict is not merely a conflict going on in a particular country. It is a continuation of the processes carried out in a whole number of the Middle East countries in which radical elements are gaining strength, undermining the inter-confessional peace. In places which they have taken over and put under their control, religious minorities including Christians are victimized. Among the telling examples is Iraq where one and a half million Christians used to live under the rule of Saddam Hussein. With the help of external force, his regime was overthrown allegedly in the name of “democracy”. But as a result of these developments, Christians have been persecuted and according to various estimates there are only 150-250 open Christians in Iraq. There are almost no Christians left in Libya. Christians in Egypt are experiencing hard times as churches have been set on fire and clergy and laity have been attacked under the “Muslim Brotherhood”. As a result, many Christians have had to flee the country. Reports about the torture and killings of Christians keep coming from other regions of the world, too – from Nigeria, Pakistan, Afghanistan and India. In Kosovo, religious shrines are defiled; many churches have been destroyed; Christians are deprived of an opportunity to visit the graves of their relatives and to pray to God in the land of their ancestors. But the Middle East remains the main hotbed of persecution against Christians. The destabilized situation in the Middle East is a consequence of not only civil confrontation but also the fact that leading world powers have their own political and economic interests in the region. Some countries stir up an inter-confessional strife there with grave consequences for the whole region. When Western powers arm cut-throats and killers, kidnappers and extremists, it is impossible to justify them by any political purposes. Local Christians become hostages to the policy carried out by Western states. The developments in Syria today cause profound concern and anxiety for the fate of Christianity in the country. Syria is a cradle of Christianity. It is in Syria that one of the first Christian communities emerged in the 1st century, and the very name of Christians has come from. Christians are the native population of that country, and they have lived there for twenty centuries. 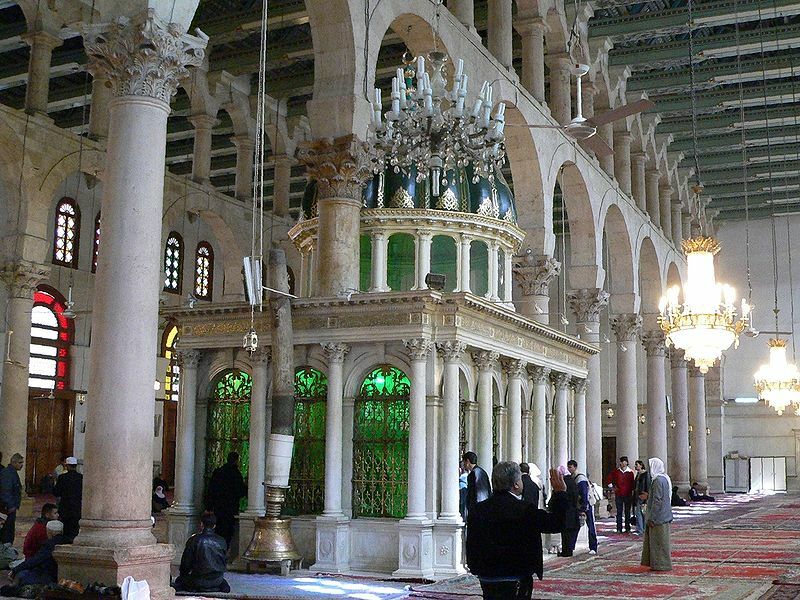 After Islam came to Syria, Christians and Muslims used to live peacefully for many centuries until the recent times. 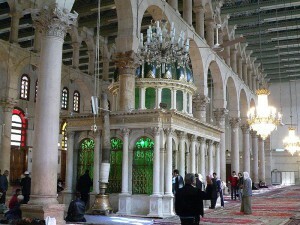 Syria used to show to the world an example of interreligious harmony. Today this interreligious balance is grossly violated. In Syria today, in the regions taken over by radical forces, Christians become their primary target. 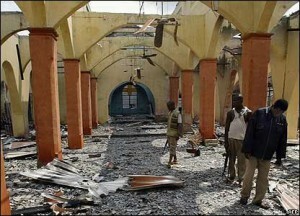 Christian churches are destroyed and defiled; Christian clergy are abducted. Monuments of world historical heritage including Muslim shrines are ravaged. Suffice it to mention the damage inflicted by militants of the Jebhat al-Nousra terrorist organization on the great Ummayyad Mosque in Aleppo. Tens, hundreds of Christians have had to flee the country or to become refugees in it. This humanitarian disaster, which has affected not only Christians but also many moderate Muslims, continues developing. According to various estimates, over two million people have already left the country. With the beginning of hostilities, religious minoritis in Syria have encountered a severe aggression towards them on the part of militants. Since then reports have come to us every week that bandits have destroyed a Christian monastery or a church, kidnapped and killed a clergyman, raped a Christian woman, drove Christian families out of their homes. 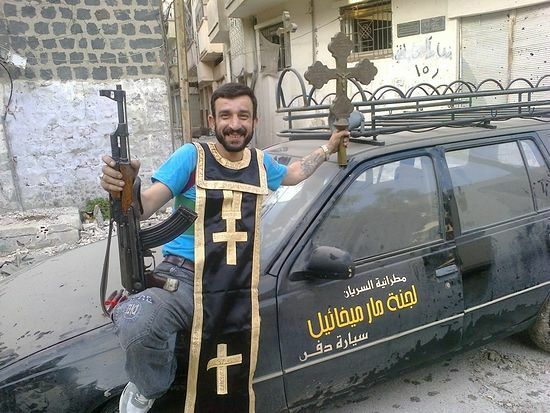 Radicals have set themselves the goal to fully eradicate Christianity in Syria. We take in the pain and suffering of Christians in Syria as our own because we know from the experience of our fathers what war and persecution for the Christian faith are. Within this report I have no opportunity to enumerate the facts of destruction of Christian shrines and property. I would like to dwell on the humanitarian aspect of the Syrian crisis. Standing in the epicentre of today’s bloody events in Syria are precisely the cities and areas in which until recently Christians made up a half of the population. These are, first of all, Homs, in which dozens of thousands of Christians used to live and in which only a few tens of them have remained, and Aleppo almost turned into ruins. Many Syrian Christians, including clergy, are regularly kidnapped and held to ransom or killed before having been tortured to make them abandon their faith. After the liberation of city quarters and villages captured by rebels, mass burial sites for Christians tortured to death have been discovered. For all that, Christians themselves have taken up a neutral stand in the civil conformation, raising their voice only in defence of peace. The clergy have shared people’s distress, seeking to give to those who suffer all the help possible for them, not sparing their own lives. Certainly, not only Christians are subjected to persecution but also the Alawites and proponents of moderate Sunni Islam including their authoritative leaders. Let us recall the death as a result of a terror act of the prominent Islamic theologian Imam Ramadan al-Buti. 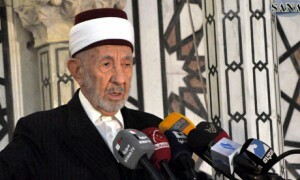 In the very beginning of the civil confrontation in Syria, the extremists killed a son of Syria’s Supreme Mufti Ahmad Badreddin Hassoun. In many areas in Syrian, a real humanitarian catastrophe has broken out, with the infrastructure destroyed and people deprived of elementary human living conditions. The most affected are the most vulnerable groups of the population, peaceful Syrians, irrespective of their faith. The head of the UN Ban Ki-moon, during a meeting on the sidelines of G20, stated that the humanitarian crisis in Syria is unprecedented in the modern history. 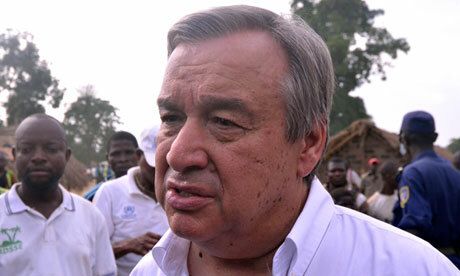 The UN High Commissioner for Refugees Antonio Gettierez has recently described the Syrian crisis as “the worst humanitarian crisis since the end of the Cold War”. Some 9,3 million Syrians stand in need of humanitarian aid. This was reported by the UN Relief Coordinator Valerie Amos on November 6, 2013. Over a half of the needy are Syrians who have had to leave their homes because of the conflict. The population of the country is 23 million. In isolated areas of the country or those besieged, there are now over 2,5 million people, most of them deprived of normal supply of water, food, electricity and medicines. The first thing I would like to draw your attention to is that already today Christian are leaving Syria at a very quick rate under the pressure of radicals and with the connivance of Western countries. In the period from the beginning of the armed conflict in Syria to spring 2013, about 400 thousand Christians have fled the country. This information was given by the Patriarch of the Melkite Catholic Church, Gregory III Laham, during his audience with Pope Francis in April 2013. As of today, the number of Christian refugees has increased ever more. Today, the almost only place where Christians can stay more or less safely is Wadi al Nasarah, “The Valley of Christians”, in which 65% residents were Christians until recently. As Bishop Silvanus Petros al-Nemeh informed us during his recent visit to Russia, it is the place where refugees from among Christians find a refuge. These are Christians from Homs, Aleppo, Damascus and other places. But there too, in the Al Hosn village with its castle Crac des Chevaliers occupied by bandits, Christians are under the threat of kidnapping and shelling which has already taken a considerable Christian toll. Christian settlements are regularly besieged by militants, causing starvation. Thus, recently the city of Hasake was besieged by militants and cut off. Over 25 000 townsmen found themselves on the brink of survival. They suffered from cold, shortage of drinking water, food, electricity until the city was liberated by the government troops. Aleppo, once a major Christian center in Syria, has ceased to be such as almost all the Christians have left the city as a result of military actions. In Syrian Maaloula, which was captured by terrorists in September 2013, there were all-round killings of both priests and lay people and destruction of churches. The militants coerced people into conversion into Islam and those who disobeyed were killed. The bodies of the dead were thrown out into the street as a warning for others. The International Society for Human Rights has reported that 200 thousand Christians have left the Syrian Aleppo alone. In Lebanon, due to a huge inflow of Syrian refugees, the social situation has been aggravated and the level of crime has grown. Those Christians who seek shelter in refugee camps have encountered new problems. They are afraid of being registered as refugees for the fear that after the war they will have nowhere to return to. On top of that, the refugee camps in Jordan and Egypt are known for cases of abuse towards Christians. Christian refugees have encountered discrimination in the camps in Jordan and Egypt too. According to the UN Refugee Agency, an increasing number of people are fleeing Syria to the Kurdistan region in northern Iraq. At present, there are 154 thousand refugees from Syria in Iraq. Along with international aid organizations, refugees receive aid, first of all, from Christians in Iraq. This has been confirmed by the president of Caritas in Iraq and the Chaldean Auxiliary Bishop of Bagdad, Shlemon Warduni. The UNICEF Children Fund has reported that it will supply over 60 litres of drinking water and foodstuffs in aid to the Syrian children who have escaped to Iraq. Assyrian Christians are mostly fleeing to Turkey, South-East Anatolia, 50 kilometres from the Syrian border. Numerous refugees have found refuge in Assyrian parishes and monasteries located in the hilly regions of Tur Abdin. The war in Syria has deeply affected Assyrian communities in the north of the country as violence, kidnappings and plunders have affected every settlement. Under the threat of death, Christians are leaving their homes by whole families. 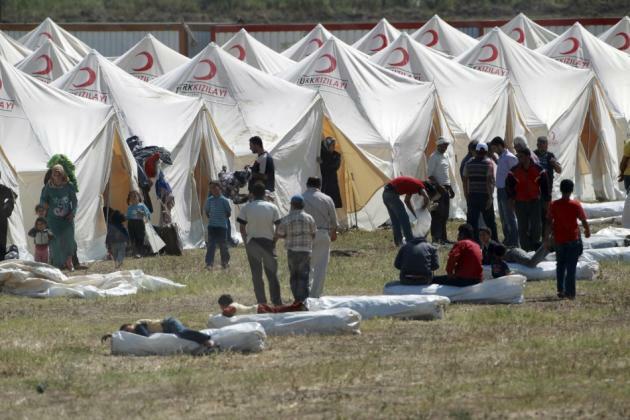 In total, 43 thousand refugees have been registered in Turkey. They stay in 8 camps organized by the authorities of the country. Two more camps are preparing to put up 10 thousand evacuees, as reported by the Catholic charity “Caritas”. Most of the Syrian Christians are fleeing to Lebanon. Refugees are hosted by families, schools and other institutions. About 1800 families or over 9 thousand people are placed in four settlements in the Beqaa Valley. The Caritas Catholic charity is providing them with all the necessities including food, sanitary kits and psychological support. There is also a movable hospital with a pediatrician, a gynecologist and a medical nurse. Over 150 thousand people have headed for Jordan, although officially a little over 35 thousand have been registered there. Most of them are staying with their relatives and friends. The city of Homs today. Within Syria proper, Caritas seeks to ensure the survival of hundreds of families in Homs, Aleppo, Damascus and small villages. The staff have to work with care enduring great difficulties with access and transportation. This week, a staff member of my Department met with an Orthodox Christian who has come from the suburbs of Syrian Homs. He says that Christians in Syria, one of the cradles of Christianity, have really found themselves in an extremely grave situation. 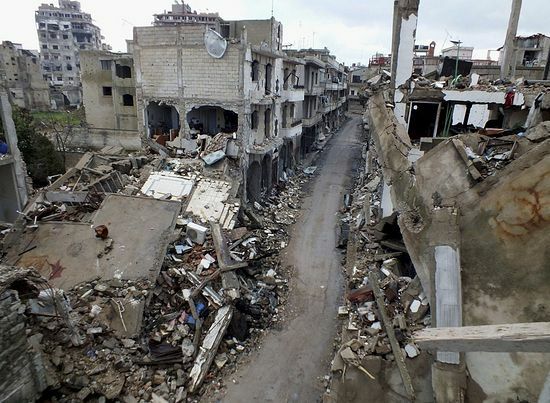 For instance, in Homs, their houses, offices and shops are fully destroyed; people have had to escape to neighbouring villages because they are subjected to periodical attacks by militants. The kidnappings and killings of Christian priests has become a permanent feature in Syria. I will give you some examples. In January 2012, Hieromonk Basil Nassar of the Patriarchate of Antioch was shot to death with two bullets in the Kafr Behum village. On January 19 of the same year, Fadey al-Haddam, a cleric of the Orthodox Church of Antioch, was captured while negotiating the release of a medical doctor kidnapped by terrorists. Six days later, his body was found on a highway near the city of Drush. There were traces of torture on his body and his eyes were put out. In February 2013, the Armenian Catholic Bishop of Aleppo Boutros Marayati reported that Michele Kayal, a cleric of his diocese, and Father Maher Mahfouz of the Patriarchate of Antioch were kidnapped on their way from Aleppo to Damascus. It was reported by Metropolitan Isaac (Barakat) of Apameia in his interview with the Voice of Russia. In February 2013, the Catholic Melkite Patriarchate in Damascus confirmed the report that another priest had been kidnapped by Islamists. Hassan Tabbarah from the Hauran diocese became the fourth Melkite priest to have been kidnapped by that time. In March 2013, L’observatoire de la Christianophobie reported that militants from the jihadist group Jebhat al-Nousra had kidnapped a Greek Catholic priest from the old city of Tabqa. In April 2013, Bishop Luka of Saydnaya, in his interview about developments in Syria, said that militants had attacked Orthodox churches in the cities of Zabadani and Harast, taking priests hostage. Despite all the efforts taken, the Syrian hierarchs, Metropolitan Paul of Aleppo and Alexandretta and Metropolitan Mar Gregory John Ibrahim, who were captured on April 22, have remained in the hands of militants. They were kidnapped at the moment when they were carrying out their pastoral duty. The captured hierarchs are ones of the most noted and respected religious leaders in Syria. Metropolitan Paul is a blood brother of the Primate of the Orthodox Church of Antioch, His Beatitude John X of Great Antioch and All the East. Reports have repeatedly appeared that the Christian hierarchs were released but they proved to be false. Metropolitan Paul of Aleppo and Metropolitan Mar Gregory John Ibrahim are still in captivity and their whereabouts are unknown. Throughout the last years, the Russian Orthodox Church has repeatedly come out in defence of the Christian population in the Middle East, giving aid to those who suffer. In August 2013 alone, our Church transferred 1 320 407 US dollars to the account of the Patriarchate of Antioch. These funds were raised with the blessing of His Holiness Patriarch Kirill of Moscow and All Russia in the Russian Orthodox churches in Russia. The money was sent for aid to victims of hostilities in Syria. In the Church of Antioch, victims of the military actions receive regular aid from the Department of Ecumenical Relations and Development (DERD). Those in need in various regions are given blankets, mattresses, foodstuffs, sanitary kits. According to the UN, what those affected by the armed conflict in Syria need most of all now are medicines, sanitary kits, electric generators, kitchen stoves, drinking water and high-energy and long shelf-life foodstuffs. What can be done by Europe? 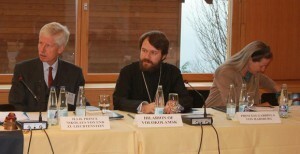 On January 20, 2011, the Council of Europe Parliamentary Assembly (PACE) adopted a Resolution on the Situation of Christians in the Context of Freedom of Religion, condemning killings or discrimination of Christians in various countries, particularly in Egypt, Nigeria, Pakistan, Iran, Iraq and the Philippines. Addressed to the governments and parliaments of these countries, the resolution was adopted by a majority vote. Those who voted for it were representatives of all the political parties present in the European Parliament. The deputies decided to set up a permanent body under the European External Action Service to monitor the developments with regard to religious freedom in the world and to give annual reports to the EU bodies and the general public about the cases of infringement on freedom of conscience on the part of authorities or social forces in various countries. The resolution of the European Parliament is important for several reasons. First, European politicians voiced out loud a problem that has been heard so far only peripherally. Thus, the actual persecution of Christians in the world was recognized by one of the main political bodies of the European Union. Secondly, for the first time a close attention was given to the work of those engaged in collecting objective information about the persecution of Christian in the world. Thirdly, in its resolution the European Parliament proposed concrete ways for influencing the situation. Their principles are simple: money and business in exchange for the respect for human rights. Economic agreements between European Union member countries and states with registered violations of the religious freedom of Christians should be concluded only if the situation of religious groups whose rights are violated is improved. Fourthly, the resolution gives considerable attention to the need to respect religious freedom as it is fixed by the fundamental international and European documents and contains a proposal for setting up mechanisms for religious freedom monitoring. At the same time, these important and timely appeals will lead to sought-for results only if they are followed by the establishment of an effective and regular mechanism of dialogue between religious communities and national and international structures. Unfortunately however, we do not see the implementation of this decision. On March 7, on the sidelines of the 22nd UN session on human rights in Geneva, a conference on “Syria: A Way to Peace” was held at the initiative of the Imperial Orthodox Palestinian Society as the oldest non-governmental organization with the consultative status at ECOSOS. The event drew a wide response in the UN Human Rights Council. It was also attended by Syrians invited by the IOPS as living witnesses to the crimes committed by extremist armed groups and to the fermentation of religious strife in the country. Participants cited concrete examples and documented facts about the brutalities committed by foreign mercenaries and told the conference about the destruction of churches and the exodus of people of various confessions, primarily Christians, from the country. One of the participants from Syria, Sister Agness Mariam, handed documented evidence over to the UN High Commissioner for Human Rights and members of the UN commission for investigating crimes in Syria. Christians in the Middle East feel left to the mercy of fate by Western countries and fear for their future. It is necessary to take steps for the protection of Christian population in the Middle East region. In particular, it is necessary to implement the principle proposed by the 2011 European Parliament Resolution whereby the aid of a particular country is possible only if the safety of the Christians in that country is guaranteed. H.S.H. Prince Nikolaus of Liechtenstein, H.E. Metropolitan Hilarion of Volokolamsk and H.R.H. Archduchess Gabriela von Habsburg attending the colloquium on Syria. In conclusion, I would like to address the Islamic leaders present here with an appeal to make efforts for putting an end to the radicalization of Muslims’ conscience which generates Christianophobia. It is our conviction that Islam is a religion of peace. In our country, there is an ages-old experience of co-existence between Christians and Muslims. We keep in direct contact with many religious leaders of the Islamic world, leading continued dialogue with the Islamic community in Iran and the Department for Religious Affairs in Turkey. Our relations with Muslims in many countries are very solid, and we are very much concerned by the fact that Islamic slogans are used today to preach radicalism and to commit actions incompatible with either religion or human dignity. We hope, pray and work and will do all so that Christianity may be preserved in Syria and refugees may come back to their homes. Metropolitan Hilarion of Volokolamsk is the chairman of the Moscow Patriarchate’s Department for External Church Relations, Russian Orthodox Church.